When making upgrades or changes to your home, choosing window coverings may be one of the last decisions you’ll need to make, but it’s also one of the most important decisions. Window coverings have a tremendous impact on the look and feel of a particular space. They provide much needed privacy as well as the versatility of letting in more light or shade. 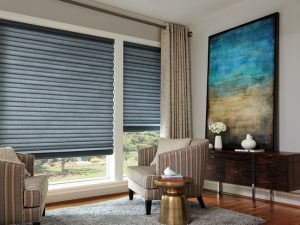 Trinity Flooring offers a wide variety of window coverings solutions, from the top brands in the industry, including Hunter Douglas, Alta Window Fashions, and Norman Window Fashions. No matter what, Trinity Flooring can find the best fit for your needs. 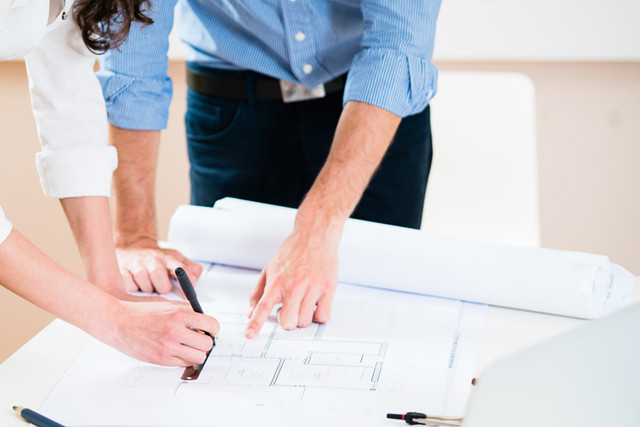 We offer personalized service and free in-home window measurements and design consultations. Stop by our showroom today or give our window coverings design consultant a call at 971-259-4725. 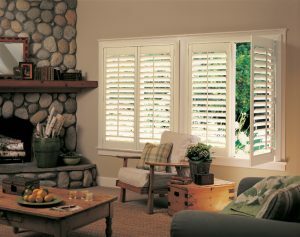 Shutters are the gold standard for window coverings. They stand the test of time for durability and for fashion. Shutters make a real statement for their versatility as well. Tilting louvers, remote control tilt, opening and folding panels, sliding panels, etc. The sky’s the limit. Trinity Flooring offers shutters from the best brands in the business with limited lifetime guarantees on the manufacturer’s shutter programs. Faux Wood Blinds have come a long way over the years. Remember the days when faux wood blinds were too heavy to raise and lower? Not so much anymore. Faux wood blinds are a lot lighter and they hold up well in the Pacific Northwest’s damp climate. Not to mention that they are affordable. They are also a versatile option for allowing light in the home, for viewing and for privacy. Solid wood blinds are even more versatile with more styles and options to choose from. They are even lighter than faux wood blinds and they really stand out when exposed to exterior light. Metallic Blinds are making a comeback! These are not the metallic blinds you used to see in the 70’s or 80’s. Our selection of blinds has a lot to offer. 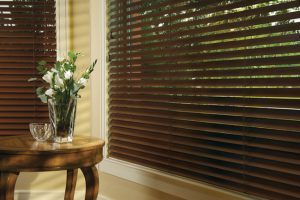 Larger and stronger slats, smoother operation, and a wide variety of patterns along with traditional matte or polished colors. If you want the best products and the best service, come take a look at what Trinity Flooring has to offer. Want the look and character of a fabric window covering with the versatility of a blind or shutter? Then look no more. Trinity Flooring offers Silhouette shadings from Hunter Douglas and Alta. These shadings are made of fabric and operate much like a roller shade, but have veins that open up when the shading is completely lowered. 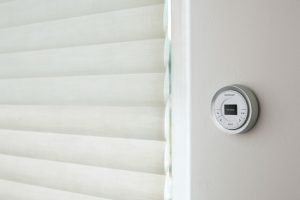 This allows you the option to view outside without completely opening the shade, as well as the ability to close the veins for complete privacy. Trinity also offers Pirouette by Hunter Douglas, a shading that has the look and feel of classic roman shades but with the added ability to open and close the veins within the shadings. Do you want your shades closed, but need to let some light in or to see outside? Well, problem solved. 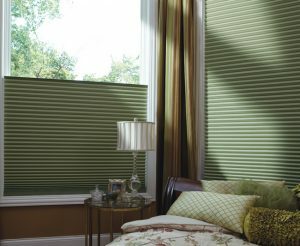 Honeycomb shades are without a doubt the most popular style of window covering in the Pacific Northwest in recent years. They have a warmth and charm that people love. They offer privacy and increased energy efficiency when closed. They come with a huge variety of options- from top down bottom up opening, to different pleat sizes, to cordless operation, to room darkening fabrics or semi-opaque fabrics. We have a nearly endless array of colors and patterns to chose from. We also offer other beautiful and unique styles that fall under the “cellular shades” banner. Such as Solera Soft Shades, a crossover of a cellular shade with a “Roman Shades” feel. Whatever you decide on, Trinity Flooring has got you covered. Roller shades are on the move. Roller shades are becoming a very popular option in commercial settings, as well as in the average home. Their simplicity is their strength. You can raise them or lower them and that’s about it. However, there’s a wide array of amazing fabrics and styles to choose from that can add a lot of character to a room. They come with motorized/remote operation, cordless/hand-controlled operation, and cord loop operation. These shades are sleek, in fashion and are very affordable option for any budget. When it comes to roller shades, Trinity Flooring has exactly what you need. Stop by our showroom today or give our window coverings design consultant a call at 971-259-4725. 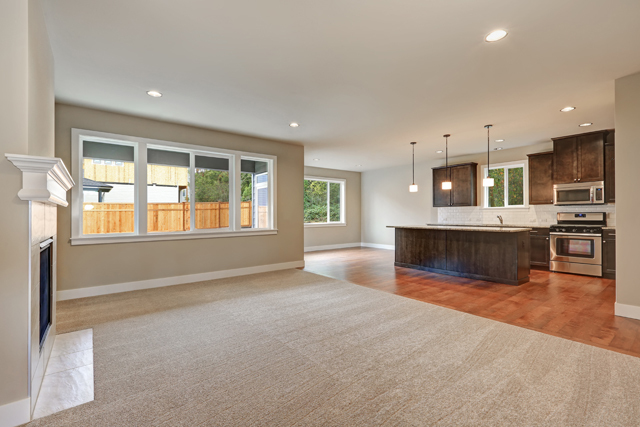 Click or call to request a free estimate and one of our flooring experts will contact you. We’ll review all the important details to ensure our estimate is complete and the way you want it. 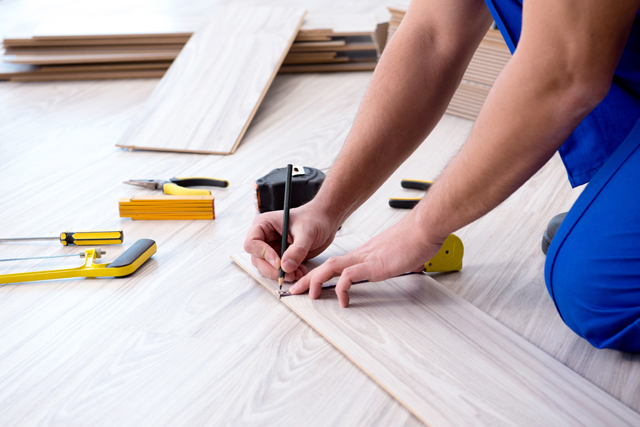 Get your flooring project done right, for the right price with Trinity Flooring! Visit our showroom today and check out our latest specials and promotions on carpet, hardwood, vinyl, countertops, window coverings, and more! Looking for a great deal? Ask one of our flooring design consultants about our current specials on top of our already low wholesale pricing! Discover the versatility, durability, and cost effectiveness of luxury vinyl tile (LVT). Utilizing the latest technologies, our manufacturers bring vivid, realistic visuals to LVT plank at a fraction of the cost and more durable than solid hardwood flooring or natural stone. Portland, Tigard, Tualatin, Beaverton, Lake Oswego, Wilsonville, Hillsboro, West Linn, Sherwood, Newberg, McMinnville, Happy Valley, Clackamas, Oregon City, Canby, Gresham, Woodburn, Salem, Keizer, and many more.